It’s fair to say that the second season of Mobile Suit Gundam 00 dialed up the action and drama quite considerably compared to the first season. Much of that was down to the protagonist Setsuna F. Seiei and his insanely powerful 00 Gundam. There was a good reason for the massively increased potency of the 00 Gundam though. It used a new Twin Drive setup for its GN drives, with the 00 Gundam using the GN drives from the Gundam Exia and 0 Gundam. The Twin Drive setup didn’t simply double the energy output from the GN drives, it squared it but due to the complexity of getting GN drives to synchronize the engineers had to figure out a way to maximize the 00 Gundam’s output. This is where the 0 Raiser came in. Seemingly a fighter, it’s actual purpose was to unleash the full power of the 00 Gundam and once docked with the mobile suit would create the 00 Raiser. The 00 Raiser then is the ultimate form of the 00 Gundam and as you would expect, what it could accomplish in the series was nothing short of miraculous. Personally, I’m a big fan of Gundam 00 as a series. It has a lot of very obvious nods to Blue Comet SPT Layzner for one, such as the remit of Celestial Being trying to avert war, Setsuna’s understated personality being much like Eiji’s and of course the Trans-Am System being a big hat tip to things like V-MAX. However, the real reason I enjoyed Gundam 00 so much was that its narrative, characters and overall setting was so well done (not to mention the great score by Kenji Kawai). While some thought the abilities of the Celestial Being mecha came from nowhere, the series did telegraph a lot of what to expect quite early on. The mecha were and still are great in Gundam 00 though. Designed by both Kanetake Ebikawa and Takayuki Yanase, these two mecha designers have a habit of working with one another. A few years back I managed to interview both of them about their work on the game Dariusburst Chronicle Saviours. They’d been working on the Dariusburst games since their inception and it’s clear they were good friends and enjoyed working together. For Gundam 00, Yanase did the other Gundams in Celestial being, whereas Ebikawa did the sleeker Gundam Exia and 00 Gundam. While Yanase’s character is somewhat cool and collected, Ebikawa is much more bubbly and excitable. He really loves nerdy old mecha and it really shows in the work he does, as his designs have a certain honest purity about them. While Ebikawa’s designs are definitely lovely to see animated they tend to cause issues when made into toys. Or did at least. This is because Ebikawa’s mecha are sleek and subtly curved, recreating that in toy form has previously been a challenge. However, the Metal Build releases of his designs from Gundam 00 definitely do them justice. The first Metal Build release from Bandai popped up in 2011 and was of the spin-off design for the 00 Gundam Seven Sword. Following that there was a separate Metal Build 0 Raiser release, with the expectation that fans would combine the two on their own to make the 00 Raiser. 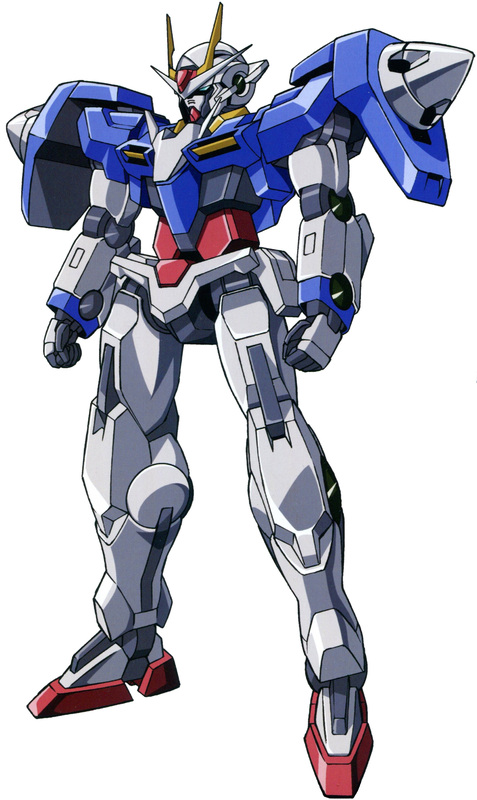 Considering that 00 Raiser was the main Gundam in the second season, you’d think Bandai would have done a standalone Metal Build release to commemorate that, as they’d already done one for the Gundam Exia. In a slightly frustrating movie, Bandai decided to release an updated and improved Metal Build 00 Raiser as a Premium Bandai webshop exclusive. As you can expect, it was hugely popular but was made in very small numbers. This means that today you will be lucky to find this toy today and if you do the price will often be eye watering. After careful searching for a few years, I managed to pick up this mighty Metal Build 00 Raiser and it is utterly glorious. This set includes both the 00 Gundam and 0 Raiser. You get a stand for each as well as all the necessary accessories. The instructions are also pretty straightforward and you should have no trouble following them. The update decals in this release are very finely done and far improved over the Seven Sword version. On the latter differences, this partly helps to explain the variety of subtle and not so subtle changes between the two versions. Personally, I think this release supersedes the Seven Sword version in almost every way. You get two GN Sword II’s as per the anime and they can swivel between sword and rifle modes. The GN Sword II can also be attached to the hip when not in use and you also get a variety of hands to hold it in its two modes. The base 00 Gundam also uses an inordinate amount of diecast in its construction, to the point that the entire endoskeleton is diecast. The result is that the joints and articulation are incredibly strong and well done. As a result you can get a deal of motion out of this figure. The GN Beam Sabers are also really nicely done and have a slightly metallic effect on the beam blade at the hilt. The 0 Raiser, like the 00 Gundam, has been updated for this release with more accurate color scheme and detailing. The 0 Raiser also has landing gear, which I am using here, but you can also use the stand provided. Unlike the 00 Gundam though, the 0 Raiser’s construction is mostly plastic. This makes a good amount of sense as it’s meant to be draped over the 00 Gundam and any additional weight would put stress on the joints. Finally, the mighty 00 Raiser. The assembly for this is pretty simple and is easy to follow. The only point worth noting is that you have to switch out the GN Drives from the base 00 Gundam for two separate ones that will allow the 0 Raiser’s “wings” to slot on to. The upside is that these GN Drives are ratcheted and allow you to pivot the “wings” in various positions. You also get a separate cockpit cover for the 0 Raiser, which is a nice touch. The iconic GN Sword III from the end of the series. Like in the anime it can fold back into gun mode. I’ve used the stand here as well, as it allows you to get some very nice action poses out of the figure. Overall, this is an incredibly nice toy. The fine decals throughout are very nicely done and the sculpt as well as the detailing are pristine in the extreme. It’s also quite a sizable figure and the amount of diecast used means it is both sturdy and reassuring heavy. The coloring over the Seven Sword version is also more coherent and accurate to the anime, so this is clearly the release to get. If you are a fan of Gundam 00 in any way then you need this Metal Build in your life but beware it can go for silly money these days. It is to match the cockpit color in the movie where the 00 gundam twin drive was replaced with 2 GN containers since they were moved too 00Q. He's talking about the O raiser cockpit, since whiny face doesn't pilot it in the movie. Ah, gotcha. I thought he was talking about the 00 Gundam rather than the 0 Raiser. Thanks! Hmmm? That's actually a rather sharp looking Gundam figure. I have mostly moved away from collecting Gundam as they more and more all start to develop a sort of sameness to them (God help me but as I age I find myself more and more liking the insane, distinct and occasionally borderline racist designs of G Gundam over much of the more modern grim dark stuff.) But this one really catches the eye. It's derivative but still has some really nice and unusual lines to it. I might just have to hunt one of these down.